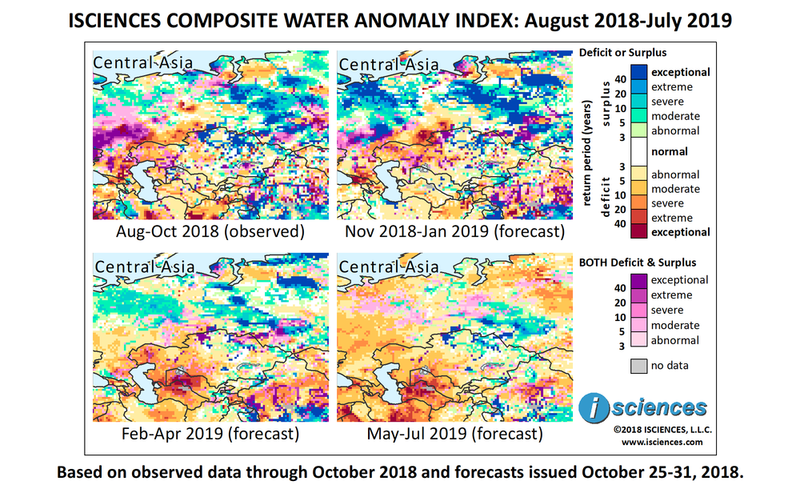 The 12-month forecast through July 2019 indicates intense deficits in Turkmenistan, Uzbekistan and western Kazakhstan, particularly around the Caspian Sea. Deficits will also be intense in the Middle and Lower Volga River and Upper Don River regions of Russia. Surpluses are forecast along the Ob River in Russia and will be widespread in the Middle and Upper Ob watershed, and will be exceptional north of Novosibirsk. Surpluses are also forecast in the Vakh River region, an eastern tributary of the Ob. Intense surpluses are expected in the Tom River watershed and moderate surpluses along the Ishim River. The forecast for northern Kazakhstan and eastern Kyrgyzstan also indicates surpluses. The forecast through January indicates intense surpluses on the Ob River in Russia with widespread surpluses in the Middle Ob region, the Yenisei watershed, the Nizhnyaya Tunguska River region (an eastern tributary of the Yenisei), and along the Vakh, Pur, and Taz Rivers. Surpluses in the Northern European Plain will intensify, becoming exceptional, and intense surpluses will re-emerge in the Volga Uplands. Deficits will intensify in the Ural River watershed of Orenburg Oblast, Russia and northwestern Kazakhstan, reaching extreme to exceptional intensity. In Turkmenistan, severe deficits will persist along the Harirud River; in Uzbekistan moderate surpluses are expected on the Zarafshon River; and in Kazakhstan severe surpluses are forecast along the Esil River in the north leading to a block of exceptional surpluses east of Astana. Deficits are forecast in central Kyrgyzstan and surpluses in the east. In Tajikistan, surpluses are expected in the west and deficits in the east. From February through April, significant deficits will emerge in Turkmenistan and Uzbekistan, and deficits will increase in western Kazakhstan. Deficits are expected to reach extreme to exceptional intensity in Turkmenistan and Uzbekistan. Deficits in eastern Tajikistan will intensify as well. In Russia, surpluses in the Northern European Plain will moderate, as will deficits in the Ural River watershed. Surpluses between the Ob and Yenisei Rivers will shrink, but surpluses will increase between the Middle Ob and the Irtysh. The forecast for the final months – May through July – indicates an increase in deficits in the Volga River Basin and the persistence of deficits in Turkmenistan, Uzbekistan, and western Kazakhstan. Surpluses in the Northern European Plain of Russia will retreat. Surpluses in the Lower and Middle Ob regions will decrease, while those in the Upper Ob and Tom River regions increase. Two months’ worth of rain fell in one day in Russia’s southern region of Krasnodar, causing floods that killed at least six people and prompted a state of emergency declaration for the cities of Sochi, Apsheronsk, and Tuapse late last month. Thousands of homes were flooded and a highway bridge collapsed. The regional governor earmarked 1 billion rubles (USD 15.2 million) for flooding aid to victims. Six months into the thaw of a natural gas trade freeze between Tajikistan and Uzbekistan, Tajikistan has imported almost 10 million cubic meters (353 million cubic feet) of natural gas. The trade freeze in 2012 resulted when tensions flared over plans in Tajikistan to build a hydroelectric dam, potentially harming Uzbek water supplies. Declining freshwater inputs to Russia’s Lake Mogilnoye have caused its toxic layer of hydrogen sulfide to rise closer to the lake’s surface by two meters (6.5 feet) over the last ten years. The lake, located on an island in the Barents Sea, historically has been composed of three layers: a freshwater layer at the top, a middle saline layer, and a hydrogen sulfide layer at the bottom. The stream that contributes the top layer has, however, completely dried, leading to the depletion of Mogilnoye’s freshwater surface layer.